Depending on the user's role (teacher, administrator, etc. ), portal homepages do vary, but many features are the same for everyone. This article describes all those common features first and finally explains the rest of the features unique to other portals. Your display name: Use this link to jump back to the portal homepage. Logout: Prevents others from jumping into an account if the user walks away from their computer. Help: This link was probably used to get to this help page. Take note that this option allows users to submit a help ticket to access School Loop's highly qualified, warm and friendly support staff. Gear icon: Goes to Account Management for all users and allows users to edit details such as username, login name, password, and email address. Teachers also can find Gradebook and Course settings here. Special features icons are also located near the top of the portal homepage, although their exact placement may be different from the image below. My Calendar: A monthly calendar displaying all event published by a user or for the user. My Website: All staff members get a personal website. LoopMail (Plus): An internal, private, email system for registered users of a site (not available for users at district office sites. Classrooms (Plus): For Teachers only. The hub for all course-related activities where teachers can preview what students see. Students and parents can access classroom assignments, lockers, and other class-related materials here. Gradebooks (Plus): Links to the current gradebook for all of a teacher's courses. Also includes links to add new and edit existing gradebooks. Groups: Collaborate with other users in a school or even with other users in a district (Standard Standalone users cannot access district-wide groups without upgrading). Portal: Includes buttons to publish news, notes, and events, along with links to build and edit the personal website. Additional tools included on the portal depending on a user's specific role. 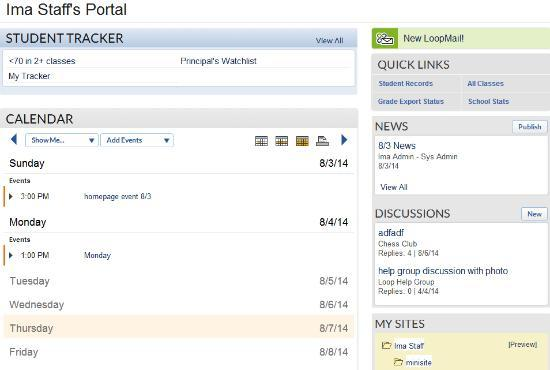 Trackers (Plus): Display all school-wide and personal trackers using the View All link. New trackers can be added using Create New. Calendar of Events: A weekly calendar displaying all event published by a user or for the user. Day and month views are available as well as filters for types of events. News: The most recently published news that applies to a user. Hover to the right of a news item, click the "X" to remove from a portal. Using the View All link will display all published news. Use the Publish button to publish news items. Discussions: A summary of the most recent posts to discussions in which users participate. Click New to post a discussion to any groups.